Want to learn how to make Halloween decorations? 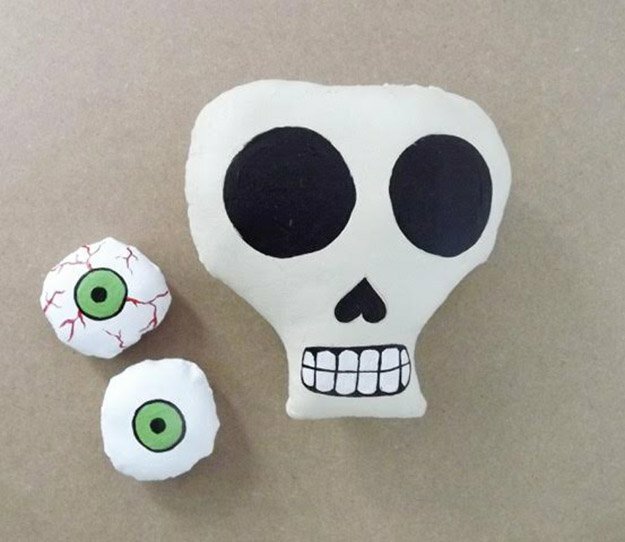 This cute DIY skull and bones will spiff up — and spook up! — your Halloween party. Why buy expensive Halloween decorations when you can make your own? 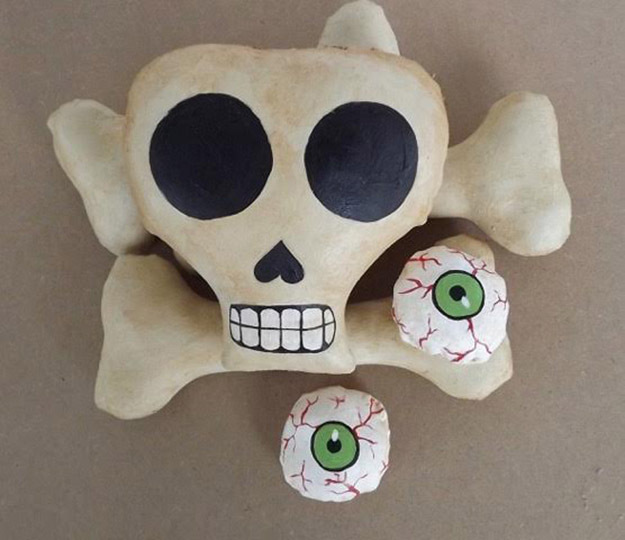 This skull, bones and bloodshot eyeballs are just what you need to kick up your Halloween table or wall decor to the next level. With a sewing machine, this a pretty low-stress project. I made a few with different expressions for a Halloween party last week and guests just loved them! In fact, I made one a prize for our Best Costume contest. Step 1. Trace patterns onto a double layer of muslin. Sew completely around each piece, leaving a small opening for turning and stuffing. Step 2. Trim excess fabric close to sewing line, clip curves and turn right side out. Step 3. Stuff all parts with fiberfill and sew opening closed. Gesso all the pieces, let them dry and sand. Step 4. Paint all the pieces black. Let dry. Sand lightly again. Paint over the black paint with white or off white paint and let dry. Step 5. Transfer face to skull and eyes. Step 6. Paint the eyes and teeth white. Paint the iris any color you prefer. Paint all the black areas of the skull. Let dry. Step 7. Using a thin brush and red color to paint the veins on the eyes. If it makes easier, draw the lines lightly with a pencil first and then paint the veins. Use black paint to finish off the eyes. Also, add a little bit of white to highlight the eyes. Step 8. To create the aged look, water down brown paint, apply it with a brush and remove excess with paper towels. You chose how aged the pieces will look by simply adding more or less paint.